A study published today in Nature Human Behavior (co-authored by yours truly) reported the result of the Social Science Replication Project (SSRP) — a multi-lab effort that replicated 21 social science lab experiments published in Science and Nature in the years 2010-2015. All of the replications were pre-registered, and their statistical power was particularly high – with replication samples that were five times larger than the original studies (on average). The SSRP attempted to replicate 21 studies, 13 of which replicated successfully. There is no guarantee that its general findings (such as replication rates) generalize to other literatures, but the results do have several interesting patterns – and they gave me 3 reasons to be cautiously optimistic about the current state of the experimental literature in the social sciences. The SSRP results are nothing worth a celebration. 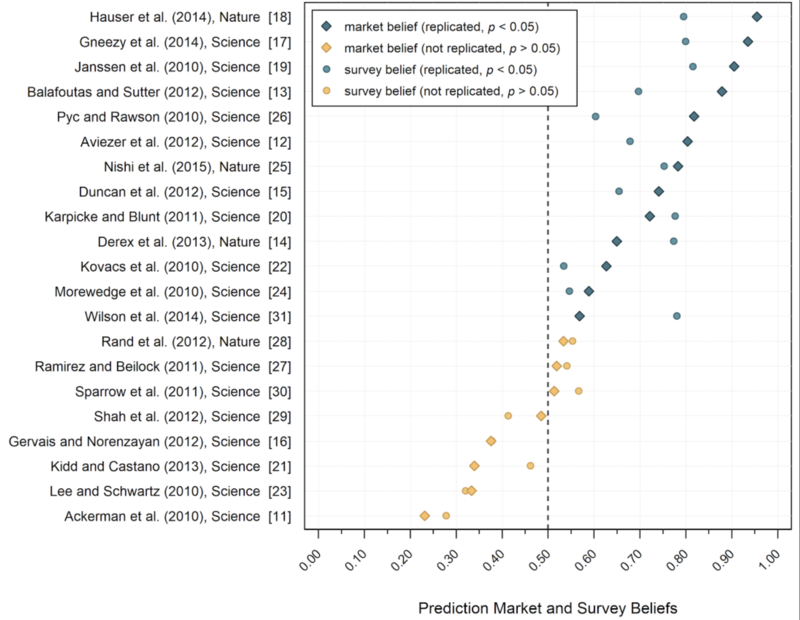 The replication rate was 62% – which means that one’s chance of randomly picking a replicable social science finding from the world’s two most impactful journals is not much greater than betting on a coin flip. But keep in mind that the goal of science is not publishing replicable papers per se. Replicability is important because it is the means towards a greater goal: accumulating evidence about the “true state” of the world. The SSRP allowed us to investigate whether the scientific community is indeed moving towards this goal. Before carrying out the replications, we conducted a survey asking 232 researchers (either PhDs or in a PhD program) about their beliefs regarding the chances that each study would successfully replicate. Each circle in the figure below is one of the 21 studies that underwent replication in the SSRP, where the horizontal axis denotes the probability that the study would replicate according to the survey (averaged across the 232 researchers). Studies that successfully replicated are colored in blue, and studies that failed to replicate are in yellow. (The rectangles represent beliefs elicited using a prediction market, that highly correlated with the survey). We cannot be sure what the researchers had relied on when forming their beliefs about replicability. There are several likely possibilities — including features of the original studies (sample size, p-value), the theories that were tested, and evidence from later published (or unpublished) follow up studies. But regardless of what they were based on, the researchers’ capacities to predict replication outcomes suggest that much knowledge about the true state of the world had accumulated, at least among our survey participants. A unique feature of the SSRP is the high statistical power of the replication studies. In the two previous large-scale replication projects, the Reproducibility Project Psychology (RPP) and Experimental Economics Replication Project (EERP), replications had about 90% power to detect the original effect size. In the SSRP, we used sample sizes that had 90% power to detect 75% of the original effect, and if a study failed to replicate (at the p<0.05 level), we collected additional data until we obtained 90% power to detect a half of the original effect. The highly powered design of the SSRP implies that type II errors were far less likely in the SSRP. Indeed, the mean replication effect size of studies that failed to replicate in the SSRP was close to zero (0.3% of the original), and none of the 95% confidence intervals included even a half of the original effects. On the contrary, the 13 successful replications had strong evidence against the null: ten were statistically significant at the p<0.01 level, and eight at the p<0.001 level. This allows us to disentangle original studies that are true positive from ones that are false positives — and estimate what effect size is expected when the original effect is true. Based on the 13 SSRP studies that replicated well, this effect size is 75% of the original, which reflects a systematic 33% inflation in the original reports. This inflation could be explained by various means, including the well-known “file drawer” problem caused by publication bias. But regardless of its cause, this finding has significant implication on how the statistical power calculations of replication studies should be conducted. The norm to date – that was adopted by the RPP and the EERP – has been to ensure that a replication study has a sample size which is large enough to achieve 90% power to detect the original effect. But if the original effect is inflated by ~33%, powering to detect it with a 90% power would only obtain 68% power in the replication. So, if the effect size inflation in the SSRP is generalizable to the literatures of the previous replication projects, it would imply that 32 out of the 100 replication studies of the RPP and ~6 out of the 18 replication studies of the EERP were a-priori expected to have type II errors. In other words, a half of the 64 papers that “failed to replicate” in the RPP, and six out of the seven papers that “failed to replicate” in the EERP are expected to represent true (but smaller) effects, that could not be detected in the replication due to low statistical power. This suggests that the replicability of the literatures that were evaluated by these projects may not as bad as previously thought. The SSRP replicated studies published between 2010 and 2015, years during which attention to methodological details slowly increased in the social sciences – thanks to the publication of several highly influential papers (for example, the article “false positive psychology” appeared in November 2011, and since then it has been cited over 2,000 times). There were also changes in editorial policies, such as the introduction of open practice badges in Psychological Science. Nine papers were published between 2010-2011, Four of them successfully replicated. Eight papers were published between 2012-2013, Four of them successfully replicated. Four papers were published between 2014-2015. All of them successfully replicated. Of course, this evidence is anecdotal (as it relies on a small sample of studies), it is not necessarily generalizable, and it is silent about causality (many other trends occurred between 2011-2015). But I’d take it as another reason for cautious optimism. My first encounter with Moïra Mikolajczak was a couple of years ago. As I was writing a review on oxytocin and trust, I stumbled upon her work in Psychological Science. I was intrigued by her finding, that giving intranasal oxytocin to human subjects made them “trust” a computer more than it made them trust a human. This result contradicted a previous high profile publication claiming that oxytocin’s effects were specific to interactions between humans. I asked Moïra to share her data. Apart from the data, Moïra also shared her recent adventures as a behavioral oxytocin researcher in humans. After what had probably been beginners’ luck, her lab could not replicate some of their initial findings. They had also failed to detect several of the effects expected from prominent behavioral oxytocin theories. She had just got back from a conference where she desperately tried to discuss her findings with several high-profile figures in the field. None were willing to share information about the amount of unpublished null findings in their labs. The conversation with Moïra made me angry. Apart from socializing and drinking, the point of going to conferences is having researchers talk to each other about their work. True, in some cases scientists might have fears of getting scooped by others. But this is not the case for null results. Sharing your failures with other researchers is especially important: it can save them the time, money and frustration of chasing non-existing effects. The chat with Moïra also made me hopeful. I was fortunate to meet an oxytocin researcher who was committed to finding the truth and understood the importance of transparent, collaborative scientific conduct. It sparked collaboration with Moïra and two of her colleagues in the university of Louvain, Anthony Lane and Olivier Luminet. Our project is published in this week’s special issue on oxytocin in the journal of Neuroendocrinology. Moïra’s lab conducted quite a few oxytocin studies over the past decade. The experiments were methodologically similar to most other works in the field with respect to sample size and oxytocin administration procedures. But only one type of studies was publishable. Positive results were greeted with enthusiasm by editors and reviewers and found their homes in top journals. Negative (or “null”) results got rejected time after time and were sent to the file drawer. In one case, a high impact journal published a suspiciously large behavioral effect of oxytocin found in a single blind study (i.e., the experimenter interacting with the subjects knew what the hypothesis was, and which subjects received oxytocin / placebo) conducted in Moïra’s lab. Her group failed to replicate their own findings twice, with larger samples and using a double blind protocol. The same exact journal rejected their (failed) replication paper. Moïra saw a publication bias rapidly emerging in front of her own eyes and it became obvious that her publication profile no longer reflected what was really going on in the lab. She made a decision to clear her lab’s file drawer, and publish all of her lab’s studies in a single article. The numbers below summarize her lab’s behavioral oxytocin research. Only a single task out of 25 produced a main effect of intranasal oxytocin: the task that failed to replicate twice (mentioned earlier). Five out of 25 experiments (20%) found significant interaction effects. It’s important to keep in mind that the probability of a type I errors is quite high when exploring interactions, unless the p-values are corrected for multiple hypothesis testing. None of the interaction effects survived such correction. Our newly published paper summarizes the results obtained in Moïra’s lab in three meta-analyses that test the overall effects of intranasal oxytocin on (1) affective, (2) behavioral and (3) cognitive variables in isolation. Neither of these meta-analyses found a reliable effect. Finally, we meta-analyzed the studies based on their relation to three prominent theories: (1) oxytocin is an “affiliation” hormone; (2) oxytocin enhances saliency of social stimuli; (3) oxytocin facilitates approach behaviors. We could not reject the null hypothesis in either case. To date, it is unclear how many unpublished oxytocin studies are lying in other labs’ file drawers. Keeping in mind that the average statistical power in behavioral oxytocin literature in humans is extremely low (12%-16%), that seminal works has failed to replicate, and given the uncertainty surrounding the physiological effects of intranasal oxytocin administration (and whether the substance gets to brain regions involved in cognition and behavior), I find it hard to believe that Moïra’s lab is an outlier. It is possible that hundreds (if not thousand) unpublished intranasal oxytocin studies are still lying in many labs’ file drawers. Moïra’s lab has set exemplary standards of scientific transparency. I hope that other researchers will adhere to these standards and release their unpublished oxytocin data as soon as possible – and turn oxytocin research into a transparent scientific endeavor. This is crucial for estimating the true effects of oxytocin administration on various behavioral outcomes. Oxytocin has dramatic influences on social behaviors of animals, and despite all of the methodological difficulties some of the effects may reflect real phenomena. Opening the oxytocin file drawer will also save time, money and frustration for many oxytocin researchers. Some dependent variables were estimated using more than a single behavioral paradigm, and some studies included more than a single task – a practice that is common in many labs, which goal is maximizing the knowledge gained from each subject that is going through a pharmacological treatment. Gidi Nave March 2, 2016 No Comments on Is the replication crisis in Psychology real? The authors of the psych replication paper have also published a response. Together with these two letters, a research article co-authored by yours truly reports a multi-lab study attempting to replicate 18 experiments published in two leading economics journals, American Economic Review (AER) and the Quarterly Journal of Economics (QJE) between 2011-2014. Below are the results of the two projects juxtaposed. There are many possible metrics for measuring the replicability of a study. Here, I counted a “successful replication” as either a statistically significant (p<0.05) replication effect (green) or a statistically significant meta-analytic effect when combining the original study and the replication (blue). As can be clearly seen from the results above, replication rates in the econ project were much higher than those of the psych project, albeit the number of studies was grater in the psych project. In this post, I will try to articulate what I see as the main point of Gilbert et al.’s commentary and explore what the econ project can teach us about the state of the psych literature. The original effect is not real. In other words, the original study is a false positive, or a “type I error”. The original effect is real, but the replication could not detect it. In other words, the replication study was a false negative, or a “type II error”. We should update our beliefs regarding the true state of the world (e.g., “there is/ isn’t a replication crisis”) differently in these two cases. The chance of successfully replicating in case (A) depends only on the original study; it will be low when replicating a false positive, regardless of the power of the replication study. This however is not the case for (B), where success depends on the replication’s statistical power: the chance of successfully rejecting the null hypothesis given that the effect is real. For a given effect size, increasing statistical power (and reducing the chance of case B’s) can be achieved by increasing the number of participants in the replication. As running more subjects costs money and takes time, researchers typically set the replication’s sample size to the minimum required for achieving sufficient statistical power (a standard power is between 80% and 90%). In practice, this is done using a mathematical formula, which is implemented by power calculators estimating the required sample size given the expected effect size. But… what is the expected effect size in the replication? It is difficult to determine exactly what effect size we should expect in the replication. If we knew, we wouldn’t have to run the study, right? As a proxy, researchers typically use the effect size of the original study. This is reasonable, as the replication attempts to be as close as possible to the original study. All replications might differ from the original studies in many ways, from geographical locations and weather conditions to the point in history when they were conducted. A fresh example from the econ replication project is a study from 2011, reporting that inducing happiness decreases temporal discounting. The original study induced happiness by having participants watch a video of a performance by Robin Williams, who since then had committed suicide. The video manipulation failed to induce happiness in the replication study and the results did not replicate. Since different subject pools are used across a study and its replication, there is plenty of reason to suspect that the pools might differ in important ways. Sometimes the behavioral task is also not perfectly replicated. As such, even if an effect were real, the effect size in a replication may be different than that in the original study – and relying on the original effect size for calculating statistical power would yield biased power calculations. This could potentially lead to more type II errors in the replication (case B). Gilbert et al. bring several specific examples (that are addressed in the reply letter) for substantial differences between the original studies and the replication attempts of the psych project, that they call “infidelities”. They claim that these “infidelities”, together with differences between the subject pools, cause a bias that often works in one direction: against the chance of finding an effect. Following the critique, I ran a few power calculations. The average effect size of replication studies in the psych project was about a half of the original, and in the econ project it was two thirds of it. Whatever the source of this shrinkage of effects in the replications may be  this suggests that reliance on the effect size of the original study might lead to underestimating the necessary sample size in the replication. This could lead to a greater chance of “case B” replication failures. I calculated the chance of failing to detect a true effect when miscalibrating the power calculation with an overly optimistic effect size estimation (table below). The outcome is statistical power of only 58% if the (true) replication effect size is only two thirds of the original study and 38% if it were a half of it. These numbers closely match the replication rates of the econ and psych projects, correspondingly . Moving forward: is there a replication crisis? If we ignore several problems in the literature that we already know of (such as p-hacking and low statistical power) and accept the proposition that changes in the protocol more often introduce noise (rather than reduce it), Gilbert et al.’s interpretation holds water and the number of “successfully replicated” studies might be under-estimated. Does this mean that the “reproducibility of psychological science is quite high”, as they claim? Much of the discussion of replication results has focused on various different metrics of replication that are concerned with estimating the percentage of studies that “successfully” replicate according to various criteria. In the previous section, I have (hopefully) convinced you that if we can live with an average replication effect size that equals a half of the original study, replication rates of the psychology project were actually going as expected if all of their effects were real. The psych project replicated studies published in three of the most prestigious and influential psych journals. Most of its authors are psychology PhDs, some are prominent professors with a long publication list in top journals. They have invested a lot of time and unprecedented amounts of money to make the replications as close as they could to the original studies. The project was completely transparent and all of the data was made publicly available. It seems obvious that its sincere goal was estimating the true state of the literature, rather than finding a “crisis”. So, if we accept Gilbert et al.’s criticism, there are only two possible conclusions. The original studies were too difficult to replicate directly without too many “infidelities”. As replication is a crucial part of every scientific process, this is a major problem. Very little deviations from the original protocol have shrunk the (true) effects of studies published in three top psych journals by a half on average. Now comes the key question: is this the type of robustness that social scientists can live with, or can we do much, much better? 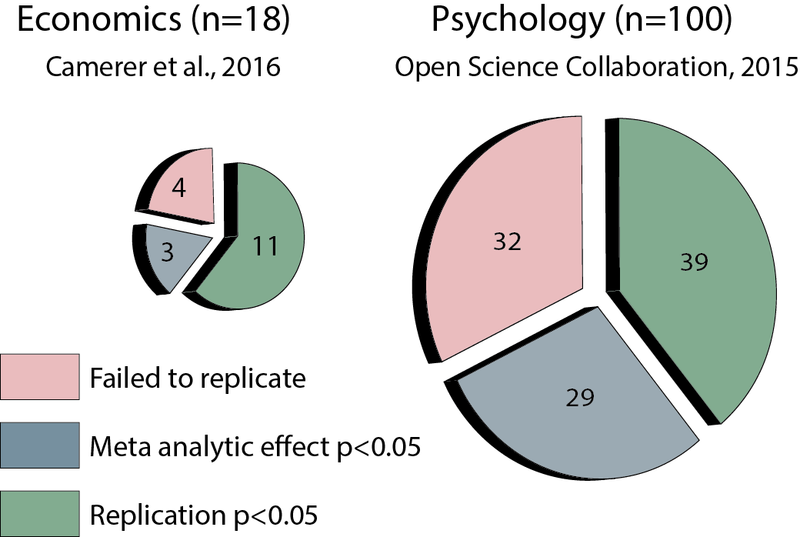 If there’s no much room for improvement, then the reproducibility of psychological science is quite high. But keep in mind, that psychological experiments are conducted in many different labs across the world and in many different points of time in history. The (ambitious) goal of psychological science is to find robust phenomena that inform general theories that tell us something about human behavior in the noisy world outside the lab. In order to make scientific progress, researchers must rely on the previous findings of their peers. If we can live with either of the two above conclusions, doesn’t it mean that the entire endeavor of psychological science is a waste of time and resources? This makes the econ replication project important. Like in the psych project, replications were conducted in different sites, with different subject pools, different experimenters and in different points in history compared to the original studies. The a-priori power calculations that were used were the same as in the psych project. This means that the econ replications also relied on the original over-estimated effect sizes when calculating the required sample size. But the econ results were different. And they suggest that something else might be going on – that is beyond a statistical artifact caused by inevitable “infidelities” in the replication process. There is a misconception that the word “crisis” in Chinese is composed of two characters, one representing danger and the other opportunity. I will adopt this misconception here. Contrasting the results of the psych and econ replication projects showes that we can do much better. The replication crisis does exist, and it gives us hope for a brighter future. In the next few posts, I will illuminate the differences in research practices between economics and psychology, and discuss whether they might have contributed to the differences in replication rates. The reason could be “infidelities”, but also case (A) errors (original studies are false positives) and publication bias. Some of the original effects are likely false positives (case A), and therefore the power calculations are somewhat pessimistic. In a newly published paper, Colin Camerer, Michael McCullough and yours truly have reviewed the literature linking the neuropeptide Oxytocin with trust in humans. As I often find myself in conversations about oxytocin – in conferences, cocktail parties or flights – I’ve collected several frequently asked questions in this post. I will try to update it regularly, please feel free to post new questions (and alternative answers) of your own. Q: Is there an association between Oxytocin and trust in humans? A: According to the scientific literature (as for late 2015), there is no strong evidence in favor this hypothesis. It doesn’t seem like spraying oxytocin onto one’s nose makes him or her more trusting, and there is no robust link between trust and either blood levels of oxytocin or oxytocin-related genetic variable. The absence of evidence, however, is not necessarily evidence of absence – it is possible that there are real effects that are too small to be detected by the current research methods, or that the effects depend on various unknown factors, such as gender, environment or other demographic variables. Q: What about other findings linking oxytocin with things like romantic love, parenting or cooperation? A: The oxytocin-trust studies are the seminal works that inspired most of oxytocin behavioral research and are among the few studies that underwent direct replication attempts by independent research groups. The failure to replicate these results, to my view, reduces the likelihood that other behavioral oxytocin findings (most of which never underwent replication attempts) reflect the true state of the world. It is possible that real discoveries are out there – but at the absence of independent replication attempts it is hard to say which ones. Also note that a recent meta-analysis concluded that most oxytocin studies are underpowered, and therefore the estimated false discovery rate is very high – around 80 (!!) percent. Moreover, promising well-cited results relating oxytocin to “mind reading” also do not seem as robust as one might hope. Q: I would like to study the effects of oxytocin on behavior and got discouraged. What should I do? Pick an oxytocin paper with an interesting result, preferably highly cited and from a top journal (Science, Nature, PNAS, Psychological Science). Conduct power analysis (you can use this calculator) based on the effect size of the original study. A standard power is 0.8, but the larger you go the better (even true effects are often over-estimated in the literature). Contact the authors of the original study and ask their collaboration. Ask them to provide all experimental materials, in order to make sure that your replication is as similar as possible to the original study. Don’t give up if they are non-cooperative, and remember to mention their levels of cooperation in your final paper, for good or bad. Submit a registered replication report or pre-register your study. Write down a short paper and publish it (regardless of your result) as a short commentary / research report. You can also upload your data to databases such as psychology file drawer. Beware that not getting a p-value which is smaller than 0.05 does not necessarily mean a failure to replicate. I recommend using the “small telescope” approach in order to test such conclusion. Q: Does oxytocin reach the brain following intranasal administration? We are not sure. Even though intranasal oxytocin has been around for quite some time, there is no consensus among researchers. My personal belief is that some molecules of oxytocin do cross the blood brain barrier after intranasal administration, but (and that’s an big but) we don’t know for sure if, how and when they reach target brain areas that plausibly control behavior and cognition. The current oxytocin literature relied on a single study from 2002 (hasn’t been replicated yet) with intranasal Arginine Vasopressin administration (a similar, but not identical molecule), and an equivalent study in oxytocin that was recently conducted (using a tiny sample size) did not find elevated levels of oxytocin in the cerebral and spinal fluid 45 minutes after administration (which is the time between administration and the behavioral task in most oxytocin studies). Q: How have we come to so strongly believe that oxytocin = trust? The seminal oxytocin-trust papers used novel behavioral paradigms and were published in high profile journals. The papers are beautifully narrated and tell a surprising, yet simple and coherent story, which is based on animal research and gained them a lot of popular media attention. Media coverage included very strong claims of scientists about the link between oxytocin and trust without mentioning that the results were preliminary or any other caveats. I’ll discuss more about this topic in future posts. Q: How should one measure peripheral Oxytocin? For blood plasma, you can use RIA or ELISA – but make sure you conduct extraction as recommended in the kit’s manual. Remember to report in detail which method you have used: although their outputs correlate – it is not identical. Some scholars have used oxytocin measurements from urine or saliva, but there several researchers have raised concerns regarding the bio-analytical validity of these measures (example 1, example 2). IMPORTANT: correlating biological measures with behaviors that are allegedly influenced by oxytocin, genetic variables or other invalid oxytocin measures (such as unextracted plasma oxytocin) DO NOT count as a bio-analytical validation. Q: I have an a-priori hypothesis about a specific environmental factor that might interact with oxytocin to influence target behavior. What should I do? Pre-register your hypothesis here and run your study. Make sure you are well powered statistically, and report your result whether you found an effect or not. Q: How can I explore the interaction between oxytocin, environment, personality and behavior without inflating the rate of false discoveries? Write down all of the environmental and personality factors that you would like to explore. 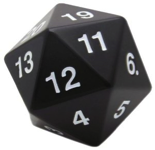 Let’s call them E and P.
Calculate N = (E+1) x (P+1): this is the number of hypotheses you are testing. Adjust your designated p-value using correction for multiple hypotheses testing, such as Bonferonni correction. Denote the new p-value by q. Conduct power analysis (you can use this calculator) based on the effect size you expect to find, and q (two-sided). A sample size that allows a power of 0.8 is standard, but the larger the better (effect sizes are often over-estimated) – go as large as you can. Run your study. Report your finding as “positive” only if your p-value is less than q. Publish your data with the necessary caveats otherwise. If you believe that some patterns in the data are worth further exploration – pre-register them as new a-priori hypotheses, and try to replicate these patterns in an independent sample of participants.